• Scan and copy everyday documents and maps at high speeds without fringing, using advanced CIS technology. • Eliminate unwanted shadows and backgrounds with the new dualilluminating system in CIS technology. 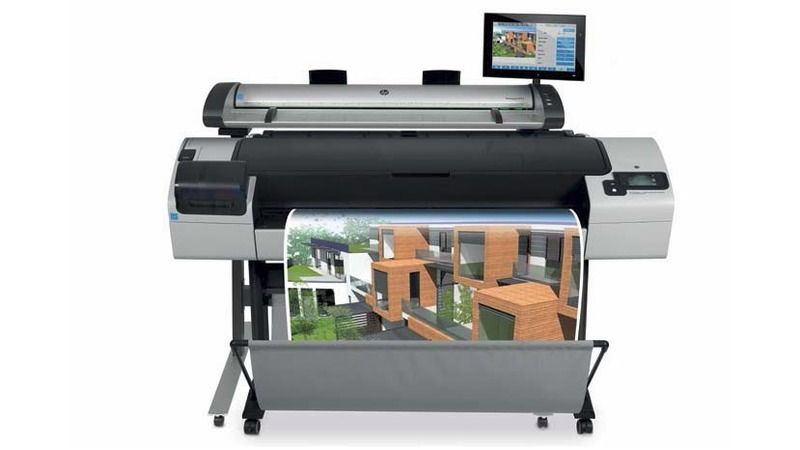 • Produce high-quality results with crisp text, scan resolution up to 1200 dpi, copy resolution up to 2400 dpi. • Create large-format color and black-and-white scans and copies up to 44 inches (1118 mm) wide. • Scan fast—up to 6 inches (152 mm) per second in color and 13 inches (330 mm) per second in black-and-white. • Accelerate workflows. Save scans as PDF, TIFF, JPEG, or DWF files. Do batch scanning. Create multipage PDFs. • Easily share images. Scan to email, USB, network—or print with the HP Designjet T1300 44-in PostScript® ePrinter. • Preview and enhance images using the large 15.6-inch (396 mm) touchscreen all-in-one PC. • Print on different paper types and sizes seamlessly, and save time using two rolls with smart switching. • Save space. Use the eight-level adjustable scanner stand to create a single footprint by positioning the scanner directly above your printer. • Process files in parallel with a 160 GB hard disk, 32 GB virtual memory, and 2 GB scan processing. • Get trusted, secure connectivity with built-in Gigabit Ethernet, advanced access control, IPv6 and IPsec.